The world has plenty of cynicism, and it has more than enough sentimentality. What it hungers for is hope – and Christians have been uniquely called to provide it. In this video, recorded at the 2015 Premier Digital Conference (and just a few hours after the Paris attacks), I contrast the work of three contemporary artists – Thomas Kinkade, Steve Cutts, and el Seed – to explore how Christian communicators can creatively share hope with the world through art, writing, speaking, and all kinds of media. Thomas Kinkade died in 2012, but not before successfully marketing his prints around the world. 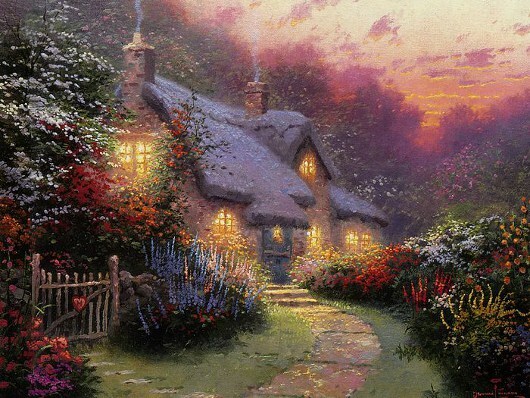 Kinkade was clearly gifted, and he presented a vision of the world people wanted to buy: a world of cosy cottages with pretty gates, flowers in full bloom and softly-smoking chimneys; a world without crime or pain. You could say his message was Everything is beautiful! But did he create hope, or just sentimentality? Steve Cutts is a London artist who sees the world very differently to Kinkade. 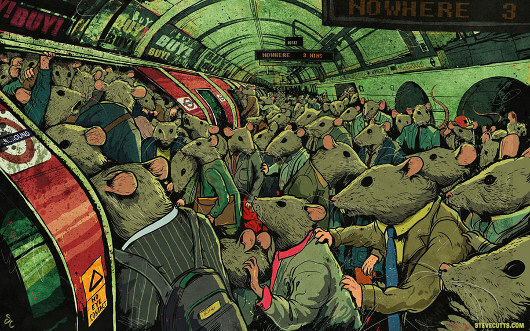 He sees a world where we join the rat race each day, boarding trains to nowhere, while the light drains from our eyes. Like political cartoonists and other confronting artists throughout the ages, Steve Cutts has some important things to say about where society is heading. You could say his message is Everything is broken! But does he create hope, or just cynicism? 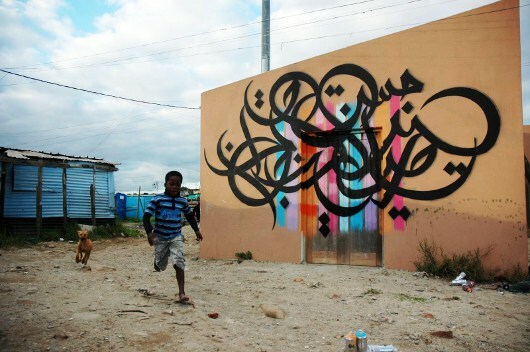 el Seed is Tunisian-born French artist. 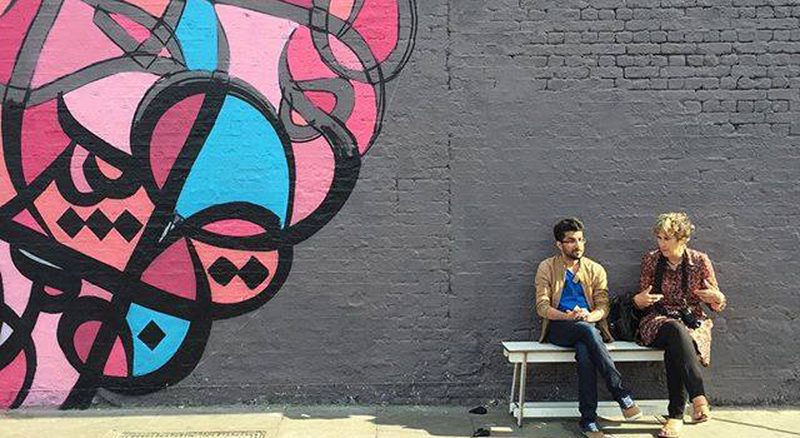 He takes Arabic calligraphy and paints it on walls in tough and desolate places, creating what he calls caligraffiti. The piece above is on the wall of a daycare centre in a Cape Town shanty village. It says ‘It always seems impossible until it is done,’ a quote by Nelson Mandela. el Seed isn’t walking into the world’s dusty streets and saying Everything is beautiful! or Everything is broken! His message is It’s broken, but there is hope. There is a place for highlighting the beauty of the world, and there’s a time to call attention to its corruption. But in the video I suggest Christian communicators haven’t reached their full potential until they learn to do what el Seed does and offer hope. And Christian hope has a unique power all its own. What do you think? Leave a comment below now or call me using the ‘Send Voicemail’ button on the right. Please also rate and share this podcast on iTunes to help others discover it! March 9, 2016More from Blog, On Writing, Speaking and Communicating, Podcast, Talks, Watch, Art, Artists, Communication, Creativity, Culture, Hope, Redemption.